WELCOME TO THE FEBRUARY 2017 EDITION OF THE GO LOCAL. GO TEXAN. E-ZINE. We have some fun articles to share with you this month, and they’re all about several exciting GO TEXAN members. Since many of you are still enjoying Valentine’s Day treats, we are going to take time to visit with the Rio Grande Valley Sugar Growers — they certainly help “sweeten” the Texas agriculture industry. In Texas, tradition and family businesses often go hand-inhand. That certainly is true for GO TEXAN member, Best Maid Products. They make some great pickles, relish, jalapenos and dressing products. The company was founded right before the start of the Great Depression, and they’re keeping the tradition and quality alive today. We are also very proud of the Texas craft brewing movement, and this month, we are highlighting the oldest craft brewery in Texas — Saint Arnold Brewing Company from Houston. I hope you enjoy this issue. Be sure to share it with your friends, and remember: Texas Agriculture Matters! 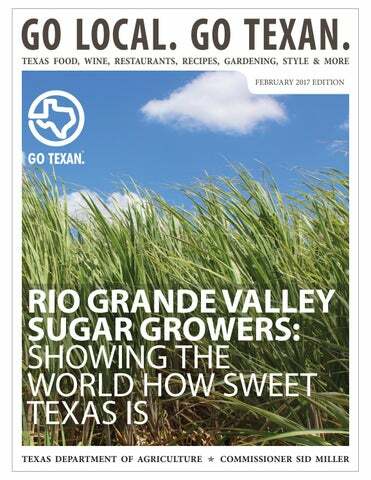 RGV SUGAR GROWERS: SHOWING THE WORLD HOW SWEET TEXAS IS SUGAR CANE HAS BEEN AN INTEGRAL PART OF THE RIO GRANDE VALLEYâ&#x20AC;&#x2122;S AGRICULTURAL PRODUCTION FOR MORE THAN 200 YEARS. THE RIO GRANDE VALLEY SUGAR GROWERS COOPERATIVE HAS A SWEET HISTORY, ALONG WITH SUGAR CANE PRODUCTION UPS AND DOWNS. Texas Agricultural Experiment Station in Weslaco and the United States Department of Agriculture (USDA), launched a feasibility study to find out if sugar cane production could be profitable again in South Texas. again. Today, RGVSG members produce more than 1.5 million tons of sugar cane per year on 40,000 acres in a three-county area. According to the Rio Grande Valley Sugar Growers (RGVSG) President and CEO, Sean Brashear, stimulating the local economy is his motivation to buy locally and just one reason he enjoys being part of the GO TEXAN program. “The best part of Texas is that we have a diverse industry,” Brashear said, “Not just the lay of the land, but we have a lot to offer to the world and we should always keep self-sustainability in mind, too.” RGVSG believes hiring local residents to work for them is a real benefit. According to their website, the national sweetener industry creates $21.1 billion in economic activity. In Texas alone, more than 8,000 jobs rely on a strong domestic sweetener industry. RGVSG typically contributes more than 10 percent of the total gross revenues the Rio Grande Valley generates from agriculture each year. Brashear mentioned RGVSG has had a slow but steady comeback from the drought a few years ago. However, with the recent rainfall and steady price of sugar, things are looking up! “In the future, we hope to bring more varieties, provide more research and testing on various sugar varieties, and expand disease control to increase the farmers’ ability to fight pests and other diseases that threaten crops,” Brashear said. Want to learn more about the Rio Grande Valley Sugar Growers? Check out their website and be sure to visit their facility from October to March. IN EDINBURG, TEXAS, ON ANY GIVEN WEEKDAY, IF YOU’RE EVER IN THE MOOD FOR SOME FRESH AND DELICIOUS CHORIZO (BE IT PORK, BEEF OR CHICKEN), CHORIZO DE SAN MANUEL IS JUST THE PLACE TO GO! uis Flores III, a Chorizo de San Manuel executive, said that the inspiration for starting Chorizo De San Manuel was to create the freshest-tasting and most natural chorizo possible. “Having a product that is Texas-made and being able to employ and help our community is a major benefit that we get to enjoy as a business owner in Texas,” Flores said. “The thing that I really appreciate the most is producing a 100 percent natural product for our customers.” According to Flores, there are no artificial colors, flavors, preservatives or additives in any of Chorizo de San Manuel’s products. He said that means customers are receiving the absolute best chorizo when they buy from Chorizo de San Manuel. give our consumers more creative ways to cook with our products,” Flores said. “We believe it helps with our sales, because once people see the dish pictured and various recipes posted, the next time they are at the grocery store, our products will definitely be on their list.” Chorizo de San Manuel is one of many GO TEXAN certified businesses that benefits from the exposure and marketing opportunities that the GO TEXAN program has to offer. “We were attracted to the GO TEXAN program, because it helps promote businesses in Texas,” Flores said. “It also promotes Texas businesses on a national and international level, too, which is great.” Flores said that Chorizo de San Manuel is excited for the many things to come and hopes to create new products and expand their distribution across the country. Brock Wagner, owner of Saint Arnold Brewing Company, said that he is not the first in his family to be interested in creating a business out of people’s love for all things alcohol. Wagner said that he began home brewing in college when his resident advisor introduced him to it. Seven years after graduating, he decided to quit his job and turn his at-home hobby into a business. When Wagner began his brewing business, it was pretty tough. He recalls that there was not really a market for craft beer in Texas, but he considered it his job to create one. It wasn’t until 2003 that Wagner felt like Saint Arnold Brewing Company was an established business. His advice for others wanting to follow in his footsteps: work hard and brew great beer. 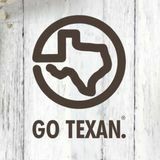 Wagner said that buying locally is so important to craft beer customers and that the GO TEXAN label automatically allows consumers to identify his brand as 100 percent Texan. “Being able to lay claim to being Texas’ oldest craft brewery is something I’m very proud of,” Wagner said. “However, I’m most proud of the team of people that work together and make our company so special.” Want to know more about Saint Arnold Brewing Company? Click here. BEST MAID IN TEXAS: WHAT A DILL-IGHTFUL STORY In 1926, Mildred Dalton began making pies and pastries to sell at her husband Jessie’s grocery store. Mildred used a great deal of egg whites to create her delicious meringue pies, but she grew tired of wasting all the egg yolks. It was then that she began to make and sell mayonnaise. Soon after, Mildred began adding a pickled relish to her mayonnaise to make a delightful sandwich spread. In order to keep up with demand for their sandwich spread, Mildred and Jessie began to grow their own cucumbers. With all of the extra cucumbers, the natural progression for the Daltons was to begin pickling, and the rest, as they say, is history! to partner with the GO TEXAN program. “We have a great network of local Texas farmers who have helped us grow our cucumbers for years,” Christy said. “We are really proud of our Texas heritage, and we wanted to make sure that other Texas loyalists know exactly what they are getting when they open a jar of Best Maid Pickles.” Best Maid Products is not slowing down. In fact, the company plans on continuing to spread their unique taste of Texas for years to come. “We are constantly working on new ideas and flavors,” Christy said. “Who knows what DILLightful flavor we will come up with next?” Check out Best Maid’s website to find new recipes, products and happenings. Dumplings Ingredients: 1 cup Flour 2 tsp. Baking powder ½ tsp. Kosher salt ½ cup Milk Soup Directions: 1. Heat butter and oil in a 6-quart saucepan over medium-high heat. 2. Season chicken with salt and pepper. 3. Working in batches, cook the chicken, flipping once, until browned (5–7 minutes). 4. Transfer chicken to a plate; set aside. 5. Add garlic, onion, carrot and celery to pan. 6. Cook, stirring occasionally, until soft (about 7 minutes). 7. Return chicken and its juices to pan with other ingredients; bring to a boil. 8. Reduce heat to medium-low and cook, covered until chicken is tender (8–10 minutes).